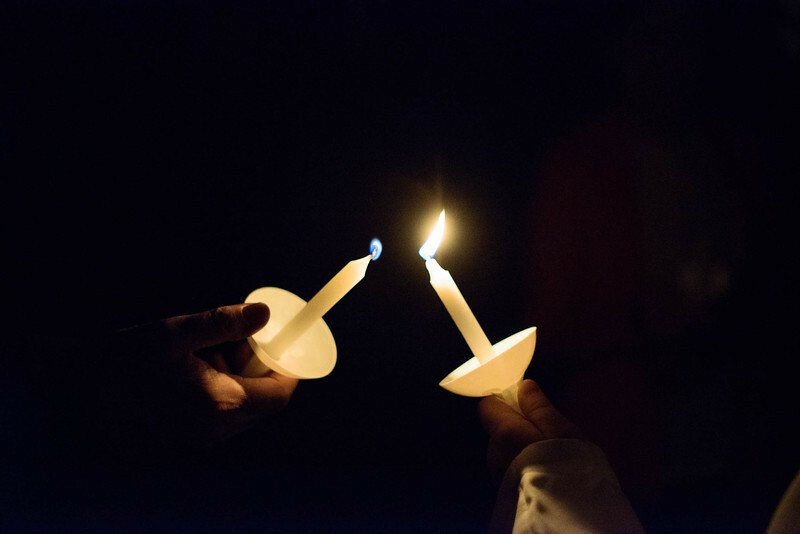 This is the Night when we gather for the Vigil of Easter. It is an ancient special service of the Church. It is very different than anything else we do throughout the year. We gather at 7 p.m. on Saturday Night, April 19. We look forward to seeing you at the Great Vigil of Easter. Here is the rest of our Holy Week Schedule: Click link. Here is a perspective on this day from Deaconess Jennifer Clark Tinker, who is a member at Martin Luther Lutheran Church: click this link for Jen’s Reflection. Like the children of Israel who watched and waited through the night for the Lord of the Exodus, we too come together this night to watch and wait for the Lord of the Resurrection. We come, as Christians have come since the first century, to keep vigil and to prepare ourselves for the arrival of the Bridegroom who is chief host and guest at the Resurrection feast to come. First, we must break the darkness of the night. Like the virgins in the parable, we must light our vigil lights. Our light will be a very special light, for it is the light of Christ which burns atop the Paschal candle and which dispels the darkness — of night, of sin, of death. Our light will be a constant reminder of the Resurrection victory during the coming season, at every baptism and at every funeral. But for now, it will burn in vigil as we await the Bridegroom. When we have settled into our pews for the watch, we hear the storytellers among us sharing the stories of our faith — the stories of God’s salvation history and the covenants which he made with our people. These are our “family” stories. We listen. We sing. We watch. And we wait for the feast to come. After hearing our stories, we make our last minute preparations to meet our Lord. All must be right for the feast. On some years those among us who have not yet joined us are brought into membership with us this night, making all who are here part of the family, which is the Church and the Bride of Christ. Each year, so that the whole family is prepared, each of us renews our baptismal vows. As we interact with the water and the Lord, we hear and we feel that grace which was given to us through our baptism. We are nearly ready. The time is close. We prepare the room and set the table for the Feast of Victory, the First Holy Communion of this greatest festival day of all. And then at last He comes! The Resurrection victory is won! The Bridegroom has come through the darkness to claim his Bride, the Church, to be his own. This is the feast of victory! In the end flowers and banners must adorn the space, for our time this evening and tomorrow will be a feast to remember. Thanks to Pr. Thomas L. Weitzel, ELCA. This introduction was adapted from his original work.